One of the great privelages of being in charge of an organisation like Space2Create is being alongside individuals who are on a journey from crisis to recovery and sharing a chunk of that journey through time spent with them creating. The exhibition now on at our Gallery in Unit 31 and ArtSpace at The Factory is a creative record of 100 days in the life of an individual facing a variety of challenges that is mental health. Only somebody who has lived those 100 days with the pain, fear, stress and hope of living with a mental illness could possibly have produced this body of work. No artists could research and develop sketch books to produce artwork that equalled this content. As such it is a very unique record, a very personal record, of a period of time that saw the roller coaster ride of mental health. The troubles with medication, the sleepless nights, the fears, confusion occupy the troughs while the peaks call out in colourful hope pictorially describing the highs and the joys of being alive. It is a journey worth sharing. I was privileged to be present at times in the creation of this record as artwork was being produced. Spontaneous, unplanned from the depth of a soul and from the heart and from the turmoil of a mind. You must travel this road. If you have suffered with mental health issues yourself this may be a tricky journey to share but you will understand. You will appreciate the steps along the way as the mood rises and falls, as fear becomes insomnia becomes beauty. You will appreciate the black humour and the complexity and the colours. If you have no experience of a mental health condition then you need to take this journey. From day 1 to day 100, walk the path and experience this expression of living a life, how abrupt the changes in mood can be, how low the lows can be and how high the highs. For me this represents a staggering achievement. To face the problems and still produce an artwork each day for 100 days. The exhibition raises funds for Leonard Cheshire Youthability and Space2Create, picture selling at £100 each. A bargain when you consider each is priceless. Exhibition continues Sunday 28th and Monday 29th May, Saturday 3rd and Sunday 4th June 11-4 at Space2Create Unit 31 and ArtSpace in The Factory Kendal before moving on to Barrow. The art created at S2C has impact on those attending sessions in many different ways. The one that probably gets the most attention is the act of creating the artwork. I have often described what it is like to be in a room with twelve people, all working to the same goal, all having some difficulties they are a facing, all with a sense of being together and yet in total silence focused and almost mindful, engrossed in their artwork. ten minutes later the same group can still be creating and focused but be howling with laughter. It is those times you know that there is some sort of healing occurring, that people are feeling better because they are there in the group and creating. Beyond this is then the sense of achievement, of having created something, for some even the act of finishing something is in itself an achievement. That starts to build confidence and esteem as their peers comment, support and praise. At S2C we also display work created, either around the workrooms or in our gallery as part of exhibitions. This raises the benefits of creating another notch as seeing your creativity framed and on the wall is a whole new level of confidence and esteem building for our service users. This week we have seen two good example of this in action. We always show work created in sessions on our Facebook page and last week I had a call from an individual who saw one of the artworks and wanted to buy it. When we told the person who had created it they lit up and glowed. During the following session it was also noticeable that they were more engaged, productive and happy with what they were creating. We have been very fortunate that a local GP practice, The James Cochrane Practice, have embraced the idea of how creativity has many positive benefits. Working with staff at the practice we have put on display artwork at their Helme Chase Surgery in Kendal. This week we had a viewing event which was well attended by our volunteers and service users. One part of this particularly stood out and that again was when we told one of our service users that one of their artworks on display had been sold. This produced a whole range of emotion from shock to being absolutely overjoyed. Again, the next day in the session the individual seemed brighter, more engaged and very enthusiastic about creating. Using creative activity as a tool to build people back up after being demolished by illness or circumstances is a very powerful tool. It does not stand alone as it also needs lots of other support but it is an effective device to help the most vulnerable start to reclaim their lives. Examples of this weeks rebuilding work…….. The art of teaching art by not teaching art……..
At S2C we have many tricky fine balancing acts to maintain (WARNING: Cliché may be deployed as a metaphorical tool within the following paragraph) and it often feels, especially to those tasked with running creative sessions, like you are attempting to keep several widely spaced plates spinning on very bendy wobbly sticks. We deliberately don’t work like an art class. The fact is that the vulnerable people we work with are often too pressured or stressed to cope in that kind of environment. Even where it is brought very much to an informal level some individuals can feel very sensitive and self conscious about what they produce regardless of their experience, skill or artistic ability. Because of this we also tend not to have courses or a series of sessions where skills and progression are clearly mapped out. For example, when feeling anxious or stressed to make a commitment to say a 10 week course is daunting. Going to the first of anything can be daunting for anyone but for an individual in crisis all that feeling can be multiplied tenfold. If they make it to the first session then the next the might have an appointment or have a day when they are in too much pain or even just getting up is terrifying. So what can happen is an individual may make it to the first, fourth, eighth and ninth sessions. This is one of the reasons we like to have drop in sessions which are self contained in that the activity that session is just for that session and the next session might be completely different or may be related but be such that it isn’t important if you missed the last one. Taking off the pressure. If you have counselling, appointments with doctors, pain, anxiety, are feeling manic, are feeling depressed, hate yourself, are afraid to go out the last thing you need is to have the added worry of having missed out. That becomes another reason to stay in which is how people become isolated. What we do helps those most vulnerable build their resilience by making it easy for them to not be isolated (as easy as we possibly can) and after time, when they are ready, they may then be able to take on a course. Then we come to the role of our session leaders and volunteers. It is the session leaders role to lead an activity in such a way, again, that it is not pressured. We often do this in a very relaxed way involving humour (sometimes very dark humour) but it feeds off the service users. Demonstrating an activity in such a way that those there feel like they want to have a go rather than feeling to daunted to even attempt it. The group look to the session leader for the skills, understanding and artistic techniques but they also look to the session leader for confidence, reassurance, empathy, awareness, permission and approval. Once the activity is underway it is the volunteers who then take up the role alongside the session leader of working beside individuals, supporting them and keeping their attention or confidence going. Often as a volunteer or session leader it is easy to forget that you are there for the service user. Your artwork is the most unimportant in the building. Volunteers in amongs the group will be looking to the service users around them to make sure all of them are included and have what they need. Some volunteers will be hanging back ready to be there or help if anyone needs more support or maybe even needs time out to go and talk quietly. The session leader also clocks up the miles. They should not be static in one place but moving round. This is where the skills of teaching come in. Being able to use differentiation in how you suggest and advise each individual. Some may just need approval to keep doing what they are doing. Others might need a suggestion of where to go next. This is where the opportunity is to develop skills and learning. It is often unplanned and is very much dependant on who is there and what they are doing. That’s the way it works. A vulnerable person attending sessions irregularly at S2C will slowly over tie accumulate a range of learning and skills but not in any particular planned way. This also includes social skills and life skills as well as artistic. Over time this all adds up to help an individual move forward and when they are ready move on. 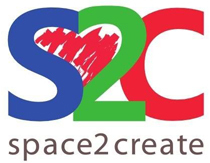 So I say a very big thank you to all the S2C volunteers who sacrifice their time and creativity to help those vulnerable people who come to S2C. Gagging orders, silent screams and the need for communityism….. Yes I did quite possibly just make up that word maybe. One of the difficulties I have as the head of a charitable organisation such as S2C is being as non political as I can. It is not easy. We have a policy of not getting involved and of not favouring any particular party as an organisation. There are very good reasons for this, particularly in the last year or so. Our aim is to create a friendly, welcoming and stress free environment at S2C and one thing that does not lend itself to this is politics. Partly because the vulnerable people we work with are very sensitive to people’s views and opinions as it is so to be sat in a room in a place you have come to escape full with split allegiances to one party or another and strained debate just adds to the stress. At an organisational level we are not set up to be politically active but more to deal with the consequences of political decisions. Like any organisations we have a relationship with various politicians at different levels because unfortunately you need to play the system sometimes to do the best for your service users. I think politicians across the board should come and listen to the stories I hear though. One of the hardest parts of running S2C is the things that people tell you. It’s those ill considered political decisions that have impact on people’s lives and in particular the vulnerable. I admit I am at a loss for words at times and can only rage silently at the injustice faced by some of those we are involved with. And that is what we at S2C do. We help those who need some space, need to tell their stories and need to feel welcome and safe. So we can vote how we feel and we can rage at the things that are wrong but we seem to be entering a time where “Democracy” is a dirty word that has been manipulated into systems which ensures the needs and opinions of the every day ordinary individuals are whitewashed by mass media misrepresentations. So I leave you with a final observation. In this town, in Kendal and other places too, you can increasingly rely less on the state to solve problems. So we see the rise of communityism, where the local community stirs and those in it strong enough to act, do. They start charities, give their time to create opportunity, provide the missing services. It should not be this way but if communities do not act then those in need will suffer more. Maybe if enough community happens then the politics will change too and we wont feel like it is too stressful to mention but will celebrate our freedoms once again. This weeks non political artwork at S2C….